MY CHILD BRIDE was hunting her roots, and I went along for the ride. The objective was to get proof of her having been baptized in the Roman Catholic Church because we need that for the First Communion of our nephew whom I have referred to hereabouts as the Little Vaquero even though now he is 11 years old. The boy is growing quickly. The Vaquero wants me to be his godfather, but since I have never joined any church, Catholic or otherwise, nor have I been baptized, I’m not eligible. I have never been touched by any organized religion or its odd practices, so I could not be the godfather. Vatican credentials are essential, they say. But there are sneaky ways to circumvent the rules. What will happen, as I understand it, is that I will be the godfather but my child bride will stand in for me at the ceremony because she has the proper credentials from On High. We just have to locate those credentials, the proof of her baptism over half a century ago, and we don’t know exactly in what church that took place. It’s the specific church that has the proof. Since she spent her early childhood in Taretan, we figured the church there would have the papers, but we were mistaken. On Tuesday morning, we headed down the autopista to Taretan. On arriving, we went to the church office where we discovered the baptism credentials of three siblings, but not hers. This is the church’s front door. It is very old. We mulled. My child bride was not born in Taretan like the other three siblings. She was born a few miles away in the larger city called Uruapan, but they lived there just briefly. But before we leave Taretan and head to Uruapan, let me tell you what I did. The church, as in most Mexican towns, faces the plaza. And near the church is an ice cream parlor named Paletería Violeta. I always sit on a sidewalk table at Violeta’s with an agua de fresa, which is a sort of strawberry-ade. I sit and watch the passing people on the plaza. We’re in Taretan a couple times each year. It’s a Mexican Mayberry. Sitting there, I noticed a man with his portable business in the plaza across the street. It was a big three-wheeled bicycle, and his business sat in front of the handlebars on a large platform. He sold, cut, squeezed and served sugar cane. He was younger than I but not by much. He wore a baggy cotton shirt, baggy cotton trousers, a large straw hat, a bushy Mexican mustache and ancient, dusty sandals, huaraches. As I was finishing my agua de fresa, he walked over and asked if I could change a 100-peso note. A customer bought a five-peso cane treat and paid with a 100-peso bill. I could not help him, and he went off hunting change. Meanwhile, my child bride was in the church office not far away. When she spoke her name to the secretary, a man sitting nearby said that he had known her father and mother. Keep in mind the whole family had moved away from Taretan almost 50 years ago. Sheriff Andy likely remembered Mayberry residents from long ago. Deputy Fife too. Small towns can stay the same, more so in Mexico now, I think, than in the United States where people are more mobile, and society is crumbling into discord. 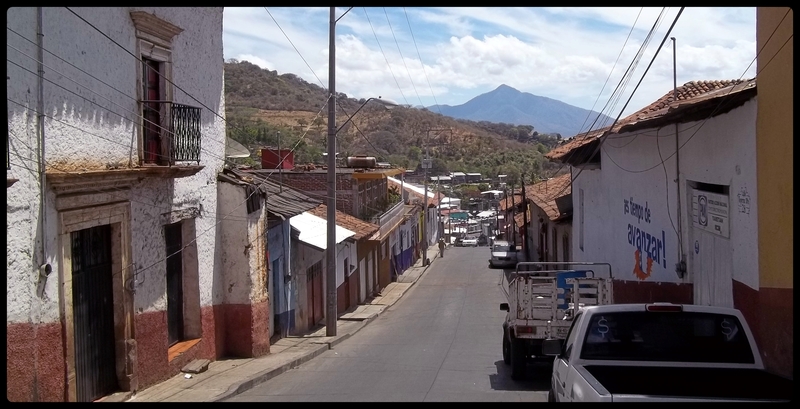 Since the baptism paper we sought was not in Taretan, we figured it was in the nearby bigger city of Uruapan where she was born. The family lived there briefly, in this house below, and her father, a doctor, saw patients in the front room. 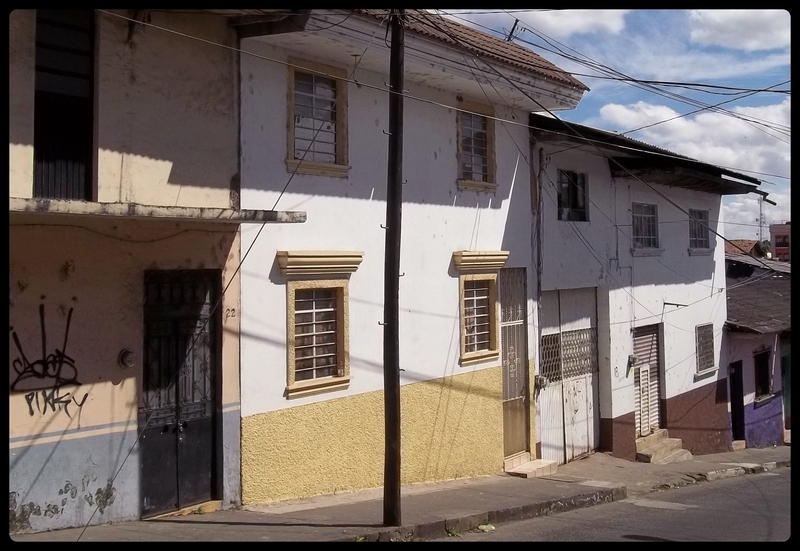 The house on Pueblita Street in Uruapan. That’s the house, yellow and white, where my young bride was born at home, not in a hospital, and her daddy delivered her. With mama’s help. Perhaps the baptism paper was available in the church nearest to where she was born. It sounded logical. Mexicans don’t wander far. We drove to #20 Pueblita Street and asked a passer-by where the nearest church was. It was on the main plaza. We arrived at lunch time, and the office was closed. Looking at a two-hour wait, we decided to return home, which we did. We’ll have to return another day, but since the Little Vaquero is not scheduled for his First Communion till next month, we have time. If the baptism paper isn’t at that church, we don’t know what we’ll do to satisfy the Vatican. But the agua de fresa alone made the trip worthwhile for me. And the sugar cane vendor with the bushy mustache. I would like to bring Darrel up to your part of the world to see that small towns really do exist in Mexico. If I do, I hope you will be about. Steve: If there is one thing that can be said about me with near certainty, it’s that I’m almost always about. Great story. If you can’t locate the baptismal certificate, can’t she just be re-baptized? I mean, she’s already Catholic, so it’s no big mental shift. 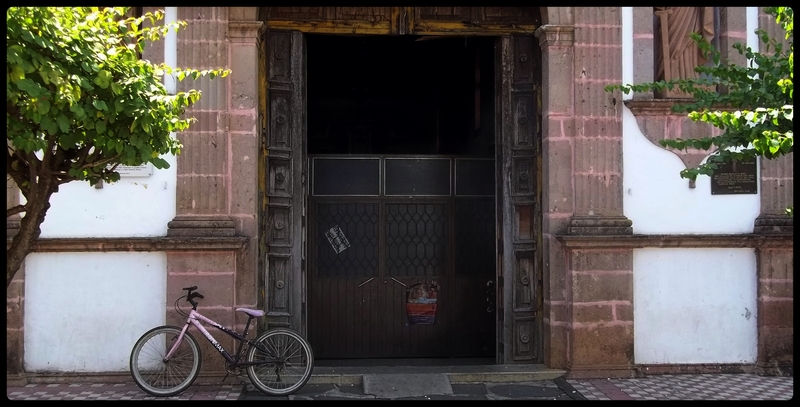 By the way, the picture of the church’s front door with the pink bicycle parked in front is one of your finer photographic efforts. Where we are thrilled that its sunny, warm, and spring-like. Unlike Boston. Kim: Rebaptized? Now there’s an interesting idea/concept. Kind of like renewing your wedding vows. She’s not much of a Catholic, however, and never has been. Her daddy was virulently anti-church. Anti-Gringo too, but that’s another matter. As for the photo, yes, I was quite pleased to find that bicycle waiting there. Sometimes things just fall into your lap. If she made her Holy Communion and has proof, that might suffice as one has to be baptized before that sacrament can take place. Andean: Only one problem with that plan. We have no idea where that paperwork is either. Could be in a town called Los Reyes where she spent her adolescence, but it’s even farther from here than Taretan and Uruapan. Who would have guessed the Atlantan squire was married to an Uruapanese lady? Andres: Yep, born there, but they almost immediately moved back to Taretan where they had lived previously. As you might have noticed, all your better people are born in Uruapan. It’s something in the air. Like magic. I am a godfather to Mexican upstarters, 4 times over. I was first a United Churcher, now a baptized Anglican non-churcher. My daughter, the Anglican priestess (minister), wanted this to happen when she was a young teenager. Young teenage daughters’ requests must be fulfilled. At first, the Catholic headman would not sanction the idea of a Gringo, heathen, non-Catholicized godfather in his abode. I believe palms were greased, and low and behold, I was accepted with open arms. I was given a book to read, of course, all in Spanish, so I have no idea what adorned the pages. Be prepared for the boda ( I believe it’s called that), a packet of coins one throws to the masses outside the church, awaiting to bless the event. I think it’s supposed to be for the children. The first time, little old ladies came out of the woodwork. Kids large and small were bowled over by the hordes of little old grannys scrambling for the pesos. Gawd, whatta mess that was. For the other three times, I used body (kid) guards to keep back the granny gangsters. Have fun. Señor Peterson: Perhaps palms are being greased in this case too. Being a priest is a pretty good gig. There’s one here who lives like royalty in a mansion. If your spouse could stand in for you, then why couldn’t any other person who has been properly annointed in the faith and who has the documents to prove it, do the same? Ms. Shoes: Makes sense, but you know that good sense or even common sense is not widespread in our nation. As for the goings-on around the whole shebang, I just go where I am pointed. I really don’t care if he gets communed or not. Bunch of nonsense as far as I am concerned. However, being linked to the Vatican is taken as a given by the citizens. You don’t even question it. Yesterday, I was pointed to the driver’s seat of the car. And I went. Get hold of the Kennedys of Massachusetts. They can make anything happen when it comes to Catholic dogma. Carole: True, no doubt. And they can make lots happen that has nothing to do with religion too. It’s sweet to be rich. I wish I were.